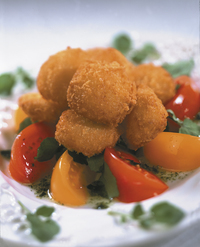 Scallops are the first ingredient in these medallions of dry scallops and premium surimi seafood.With no water loss during cooking, operators can consistently offer upscale scallop dishes anywhere on the menu at an affordable price. Keep Frozen. If refrigerated below 38°F, use within 60 days. Once opened, keep refrigerated and use within 10 days. Do not refreeze.